In November 2013, Kansas City, Missouri’s first responders, mental health providers, municipal court and mayor’s office decided that enough was enough. Our community knew that the number of arrested and jailed individuals with mental illness was unacceptable, and any solution required cross-systems collaboration between local government, criminal justice and mental health. 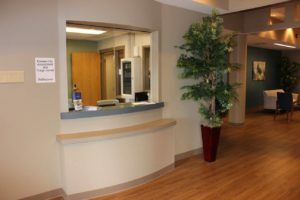 To address the problem, the City of Kansas City, the Kansas City Police Department, community-based organizations and seven Kansas City area hospitals created the ReDiscover Kansas City Assessment and Triage Center (KC-ATC), which opened on October 31. After being picked up by law enforcement or referred by a local hospital, clients can stay at the center for up to 23 hours, providing enough time for KC-ATC employees to provide mental health and substance use treatment and develop post-treatment plans, like provider referrals, emergency housing preparation and prescriptions. By providing a space dedicated to mental health and substance use treatment, clients avoid more restrictive and inappropriate placements. Before our collaboration, the only real options for law enforcement were to hold people with mental illness in jail or send them to a hospital emergency room. Jails are never an appropriate setting for someone in a mental health crisis and ERs are often overcrowded and ill-equipped to handle psychiatric conditions. Without accessible behavioral health services, mental illness put an unyielding strain on police departments and ERs. In fact, Kansas City ERs experienced, on average, 9,000 visits for serious mental illness each year from 2012 to 2014. Even before opening our doors, the KC-ATC already had a tremendous impact. From July to September 2016, we decreased homelessness among some of Kansas City’s frequent ER users by 75 percent using emergency housing granted to us by the Department of Mental Health and the Jackson County anti-drug tax. These new residents are at a decreased risk of drug use and have clear access to health services, decreasing the likelihood of further contact with the municipal court and hospitals. We hope not only to make a difference in our community’s mental health but also to ignite conversations about mental health in other communities. As we treat clients who otherwise would be in jail, we hope to serve as an example of how to dissociate mental illness from incarceration. Through our work with the Kansas City Police Department, we hope to show that law enforcement officers play a vital role in community mental health. Moreover, as we work with clients, we hope to open the doors of treatment and recovery to those who need it most. On August 17, Lauren Moyer and Judge Joseph Locascio participated in a forum held by the Behavioral Health + Economic Network (BHECON) in partnership with the Missouri Coalition for Community Behavioral Healthcare. The goal of the public forum was to provide a scan of the current intersection of law enforcement, the courts, and the behavioral health system in Missouri, identify gaps and challenges facing the current system, and delve into policy changes needed to support a better continuum of care. To learn more click here.